There are healthy people who always will complain about how difficult things are. They go on about their pains and weaknesses. But there are also those who were born fighters, those who will remain as such their entire lives – no matter what happens to them. One of these born fighters is 21-year-old RON HALEVI from Kibbutz Gesher in northern Israel. When he was just 13 years old, Ron had already begun to train on a kayak in the Sea of Galilee near his Kibbutz. He spent 2 hours a day rowing, investing a lot of energy – although he never really thought of turning rowing into an athletic career. For him it was mostly a hobby and a fun means to stay in shape. “I won a few medals, but it was never something serious,” Ron says. Like many other young men, when he was drafted into the IDF he left behind his athletic pursuits. 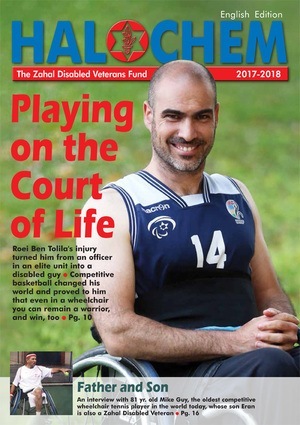 He served in the Tank Corp, completed the commanders’ course, and, as a sergeant during Operation Protective Edge, served as a commander in a support company. Five of his comrades were killed at this incident: Omri Tal, Shai Kushnir, Noam Rosenthal, Daniel Marsh and Liran Edry. Ron and nine other soldiers were wounded. He suffered from shrapnel wounds to his leg and was evacuated by a helicopter to the Tel Hashomer Medical Center. It was there that “the doctors explained to me that my leg could not be saved and it was amputated under the knee,” Ron recounts. Despite the loss of his leg, he didn’t break, underwent rehab and got a prosthetic leg. “Two months after the injury, I already started walking”. He said he was encouraged by other amputees who came to visit him: “They showed me that even if you’re left with only one leg, it’s certainly not the end of the world. I understood very quickly that life goes on”. Part of his rehabilitation took place at Haifa’s Beit Halochem. Indeed, just six months after he was injured, and after having been fitted with a new leg which can be used in water, Ron decided to return to kayaking. Since then, he has been spending two hours a day rowing. Unlike during his youth, this time he is motivated to compete for medals. 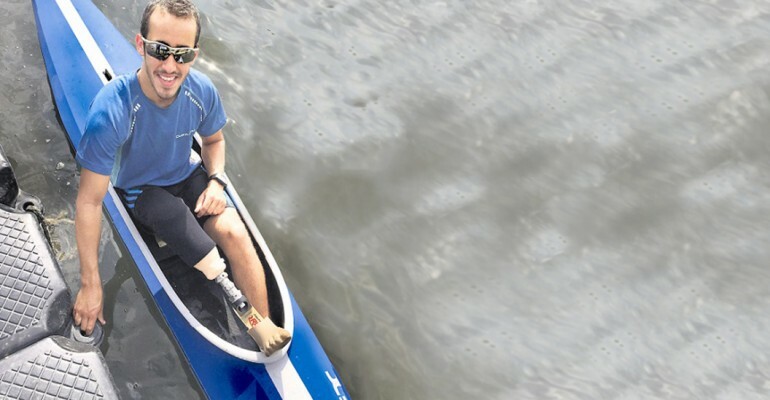 In August 2015, he will compete in the world championships for disabled kayaking, rowing in the 200 meters category. The competition will take place in Milano, and Ron believes he will get to one of the middle level places.